The unit occupies a prominent position to the east of Dunn Street, close to it’s junction with London Road and within the Parkhead area of Glasgow, approximately 3 miles east of Glasgow City Centre. Dunn Street links Dalmarnock Road to the south with London Road to the north and therefore comprises a busy thoroughfare at most times of the day. The unit benefits from an excellent roads infrastructure, with the M74, which is easily accessible from the property at J1A, providing a direct link to Glasgow City Centre and also provides direct links south and to the M73/M80. In addition, the recently completed East End Regeneration Route provides direct links between the M74 and the M8. Occupiers in the area incude Emirates Arena and Clyde Gateway East Business Park, with Dalmarnock railway station a short distance away. The immediate vicinity is generally characterised by industrial properties with occupiers including Grahams plumbers merchants, APM Contracts and Glasgow Taxis. 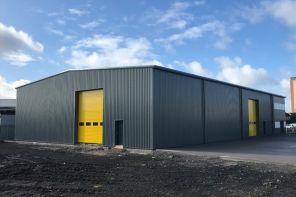 The unit comprises a modern detached industrial unit of steel portal frame construction, sheeted in double skin insulated profiled metal cladding to the walls and roof. The unit, which can be finished to suit occupier requirements, can be provided with a dedicated office area, incorporating double glazed window units facing the parking area and main road. The unit includes a large staff/customer parking area finished in concrete and a substantial dedicated yard, which can be separated by way of steel palisade fencing. The building will be provided to a shell specification, awaiting tenant fit-out. Our client can provide an office fit-out if required, by separate negotiation.